In the epilogue of her book Joanna Olczak-Ronikier describes how, after her mother's death, she had to clear out her flat. "There wasn't much of value," she says, "but from every drawer of the ash-wood chest and the writing desk came an endless stream of letters, postcards, wedding announcements, children's drawings, photographs and newspaper cuttings about the family. (...) I bought two large wicker baskets and packed it all into them without sorting or even looking at any of it. My home was dying all over again, and I couldn't afford to be sentimental about a lot of old scraps of paper. For years the baskets were a faithful companion through my nomadic life, every once in a while changing address along with me. They were always in the way, being a nuisance and taking up space, and I never so much as took a peep at them. I didn't feel like the proper heiress to this particular legacy, consisting as it did of other people's affections, regrets and nostalgia. After my mother's death my encounters with my relatives became rarer and rarer. Whenever we did meet, it was said that someone should write the history of our family, but nothing ever came of it." 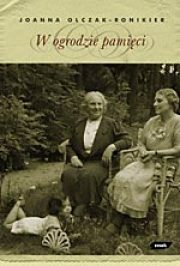 Yet finally more than 100 years of the history of this family has been described with deep insight by Joanna Olczak-Ronikier. The action of this family saga takes place in Warsaw, Paris, Moscow, Bombay, Ostend and New York, in bourgeois drawing rooms, at European spas, in a tsarist prison, Soviet camps and occupation-era hiding places. Its heroes, all related by blood, are merchants and socialists, bankers and emancipationists, French bankers and Polish intellectuals, a famous publisher, a counter-espionage agent, a heroic RAF pilot and an American psychiatrist. Written with epic force, this story is an exceptional event in Polish - and not only Polish - literature. Laureate of the very prestigeous literary award NIKE'2002 (more...). Joanna Olczak-Ronikier - co-founder of the famous Cracow Cabaret "Piwnica pod Baranami", screenwriter and playwright. She comes from a family of writers and publishers.